The European Central Bank (ECB) announced last Thursday that it will be winding down its Quantitative Easing (QE) programme by the end of 2018. The current programme comprises purchases of sovereign bonds of €30 billion per month until the end of September 2018. At last week’s ECB’s monetary policy meeting, it was decided that the asset purchase programme will decline to €15 billion a month between October and December and thereafter the ECB will bring its QE programme to an end. It is worth recalling that the bond buying programme was officially announced by the ECB on 22 January 2015 and commenced in March 2015 at a rate of €60 billion per month. This monetary easing mechanism involved the purchase of assets (normally government bonds) by each of the central banks within the eurozone from commercial banks or other financial institutions in order to inject cash into the respective economies. The intention was for banks to use the extra funds to increase lending to households and businesses thereby helping to provide a boost to economic growth. The ECB adjusted its QE programme during the last three years and had initially increased the monthly purchases to €80 billion per month between April 2016 and March 2017 before starting a gradual winding down since April 2017. The QE programme, or as it was later called the Public Sector Purchase Programme (PSPP), was naturally conducted in Malta by the Central Bank of Malta who was mandated to purchase a value of around €36 million per month in Malta Government Stocks between March 2015 and September 2016. The amount was subsequently adjusted over time in line with the changes announced by the ECB. The bond repurchase programme is only eligible for minimum quantities of €100,000 (nominal) per MGS and therefore investors holding amounts less than this in any particular security have not been able to take advantage of this programme and would have needed to liquidate their securities via the traditional channels on the secondary market. Few market participants may have kept track of the amount of MGS’s purchased by the Central Bank of Malta since early 2015. This information is available on the website of the ECB and indicates that a total of €1.1 billion in MGS’s have so far been repurchased. The QE programme led to a rally in sovereign bond prices across the eurozone including Malta which started in anticipation of the commencement of the bond repurchase programme in early 2014. 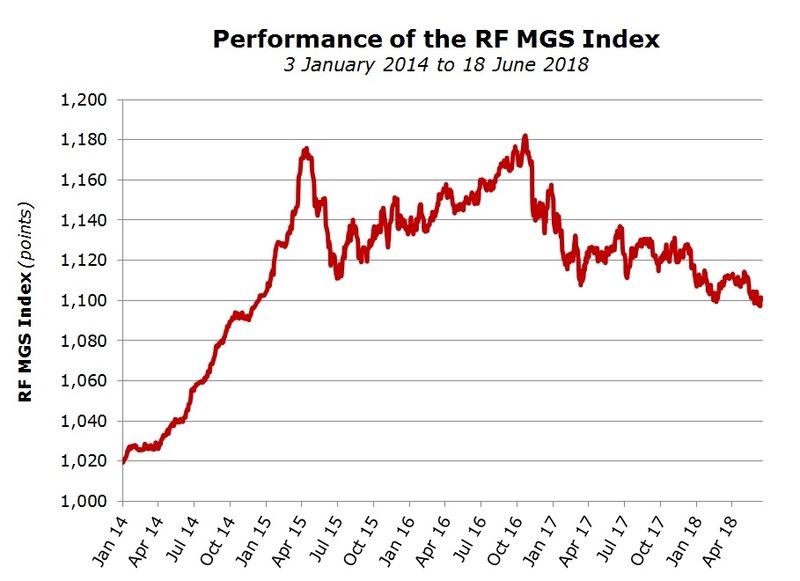 This can be seen from the performance of the RF MGS Index over recent years. In fact, the RF MGS Index (which gauges the daily movements in the indicative opening bid prices of MGS’s quoted by the Central Bank of Malta) showed an extraordinary increase of 8.4% in 2014 and continued to perform positively in the following two years albeit to a lesser extent. MGS prices peaked in October 2016 whilst in 2017, MGS prices registered their first annual decline since 2011. In recent years, I regularly published articles showing the intense volatility in MGS prices from one period to the next (especially during the final quarter of 2016) as these were influenced by various international factors, most notably the regular publication of economic data, statements by key officials of the major central banks across the world as well as global political developments. Many investors who still continue to hold a large positions in MGS’s should question what the impact on MGS prices would be as the QE programme ends. In the same manner as seen in 2014 and 2015 when yields on eurozone sovereign bonds declined rapidly as the QE programme commenced, it would be natural to assume that the opposite happens and yields rise (bond prices decline) to reflect the gradual monetary policy normalisation efforts of the ECB. This commitment was rather surprising as many international economists had expected interest rates to begin rising by mid-2019. Moreover, the ECB also confirmed its commitment to reinvest proceeds arising from redemptions of bonds that have been purchased in recent years for “an extended period of time” after QE ends and “in any case for as long as necessary to maintain favourable liquidity conditions and an ample degree of monetary accommodation”. These cautious announcements by the ECB in fact led to a decline in yields and a strengthening in bond prices. Normally, as a central bank signals an end to extraordinary monetary stimulus measures one would have expected a different reaction across financial markets. Moreover, the euro weakened against the US Dollar to below the USD1.16 level also as a result of the announcement the previous day by the US Federal Reserve of its second rate hike for 2018 and its seventh interest rate increase since 2015. Moreover, the US Federal Reserve confirmed that it plans a further two increases in interest rates this year as well as three rate hikes in 2019 on the back of the momentum being registered by the US economy. Sovereign bond prices across the eurozone (including MGS’s) have experienced intense bouts of volatility in recent years. This volatility is likely to continue and bond prices will remain highly responsive to economic data across the eurozone as well as political developments. As I also mentioned in the past, MGS prices are still linked to a certain extent to movements in yields across the periphery countries and political developments in Italy will continue to influence MGS price movements. It is positive to note that following the formation of a new coalition government, last week Italian bonds experienced their best week since September 2012. The prudent approach by the ECB should continue to maintain buoyant conditions for new bond and equity listings as probable ECB increases in interest rates from September 2019 onwards are likely to be gradual. Meanwhile, investors still holding sizeable exposures to MGS’s should note that the MGS market ought to become less liquid due to the lack of any QE purchases as from January 2019.